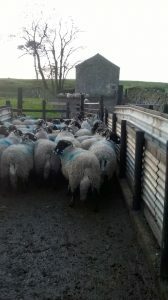 Well it’s back to that time of year again and we are working with the sheep most days, getting them ready for tupping. 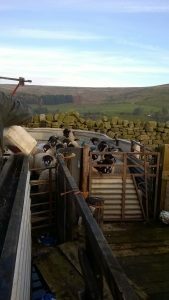 Before we let the tups go with the ewes we have to get them ready, normally we do this at two weeks before we let the tups in. We started with the Masham ewes, we trimmed their tails so that it makes it easier for the tup to do his job (all the ewes have their tails trimmed). We also give them some vitamins in a liquid form to give them a bit of a boost, to try and make them at their most fertile. Also depending on which flock of sheep we are working with, they may also get a fluke drench as fluke is very nasty if the sheep get it. Fluke attacks the liver and eventually kills the sheep if it is not treated. Fluke is also more common if it has been a wet time or if the sheep are out of a very wet field. The ewes are flushed before the tups go to them, meaning that they get a change of field which normally has more grass in, so that they could come a tupping closer together if we leave them two weeks before the tups go in. All the horned ewes are separated into different lots, some are sorted by the colour of their face and size if they are being loosed to a Blue face leister tup or Teeswater. If they are sorted to a pure Dalesbred tup then it is age and flock which the ewes are separated into. It is important to separate the ewes that are put to the Blue face leister or Teeswater as some of the ewes are too dark for one tup or too light for another, so separating helps to try and get well marked lambs for next year. Generally the darker ewes are put to the Blue face leister whereas the lighter ones go to the Teeswater. Sorting the ewes that go to the pure tup is slightly more complicated as we sort ages and the flock that they are from. Most of the ewes are easy to separate for ages as each different age of sheep have a different colour tag in their ear. Sorting the flock which they are from is done by the horn burn or ear mark, as these are permanent marks so we can always tell which flock a ewe is from. If we get them wrong some ewes could be tupped by their fathers so we keep a record of which tup has been with which lot of sheep. Once we have sorted them out the tups are ruddled with a separate colour for the ages in the flock, our moor sheep have the shearlings (one year old ewes) with red, 2 shears have Green and the 3 shears have orange. This way we can easily see when the ewes lamb, which tup has gotten which sheep. Ruddling the tups is sometimes an easy job but other times you can get dragged down a hill by a tup, yesterday both myself and my brother both got dragged down with one of the tups that we bought this year, but we didn’t let it get away. The tup got ruddled and then went back to work. Some are easy as they just come to a bucket full of cake and let you ruddle them. One tup normally has around 50 sheep but some tups can tup up to a 100 ewes. It is becoming more of a problem with people leaving gates open, as once we have sorted the sheep out they need to be kept separate, as the tups could get to the wrong packet of sheep and tup their daughters. It is not a five minute job to sort the sheep back out into the different lots, so making sure gates are shut is very important. We now have to have sheep in a field and then leave a field free between them as gates are that much of a problem and then sometimes they still get mixed up.